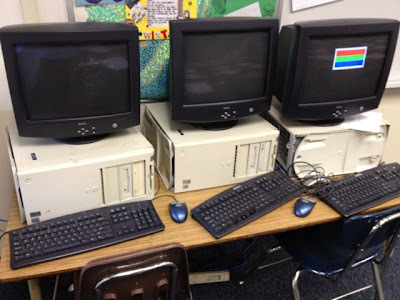 This is a picture of three computers which can be found in a classroom for resource students. The computers are so old that they can not be connected to the internet or even any modern printer. They lack the ability to do little more then type and even then are slow. They break down often and are said to be the oldest computers in the district not just the school site. This is socially unjust especially considering these are in class these are in a class with students already struggling to write let alone type.